I am honored to have been re-elect to the City of Fairfax City Council for the 2018-2020 term! Thank you to all for the support! Thank you to all the candidates for a great discussion on April 11 at the Candidates forum. In case you missed the event, be sure to check it out on YouTube or replayed on Channel 12. If you are interested in a quick look, each candidate gives a 90 second opening and a 60 second closing. I am at the 6 minute mark and then around the 1 hour 24 minute mark. May 1st is just around the corner! This evening, I officially announced that I am running for re-election to continue to serve on the City of Fairfax City Council. Thank you to everyone who was able to come out to Twins Ace Hardware tonight. I want to say a special thank you to Mayor David Meyer, former Mayor and Councilmember Steve Stombres and former Mayor John Mason for their endorsements and continued support. The election is 50 days away and I look forward to seeing everyone out in the City. I ask for your continued support and your vote on May 1. 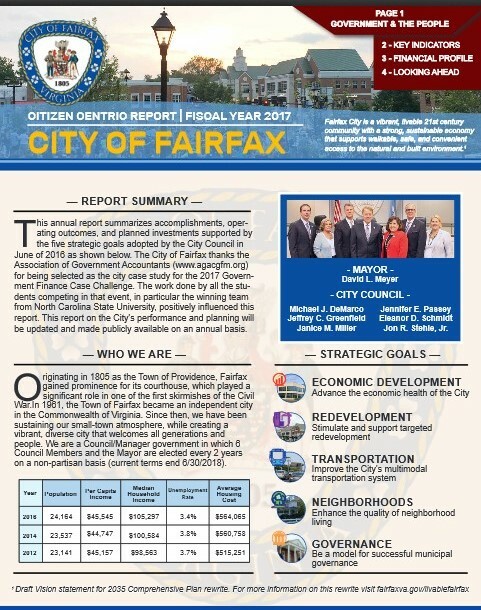 I am incredibly excited that this weekend, households across the City of Fairfax received our first annual annual Citizen Centric Report (CCR) as an insert to the March City Scene. The report, available online, was a result of great work by our City Staff in collaboration with the Mayor and City Council. 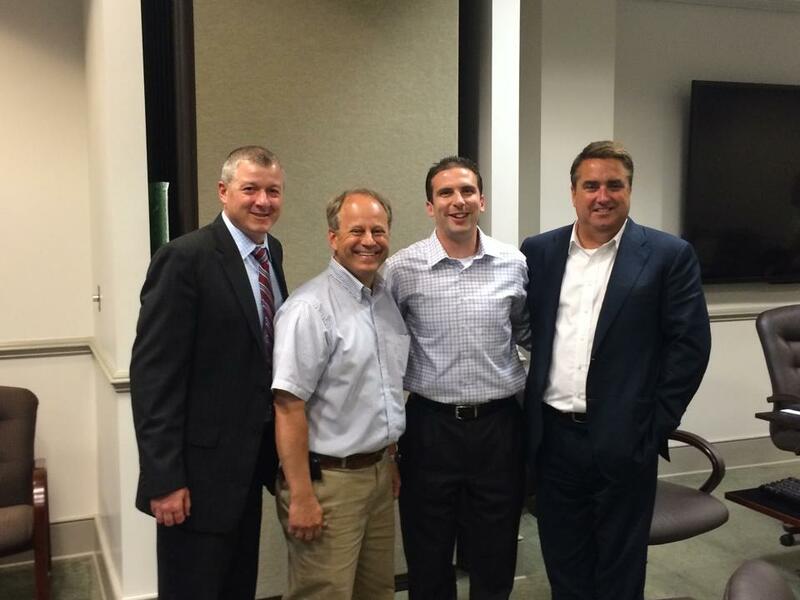 In addition, the City of Fairfax benefited greatly from being the case study city for the 2017 Government Finance Case Challenge sponsored by the Association of Government Accountants (www.agacgfm.org). I want to give a special shout out to the team from North Carolina State University who won the 2017 Government Finance Case Challenge. Much of their winning design was incorporated into our first annual CCR. I hope everyone will take a few minutes to review this report and provide any feedback to all of us here at the City of Fairfax on how we can make the report even better for next years CCR. 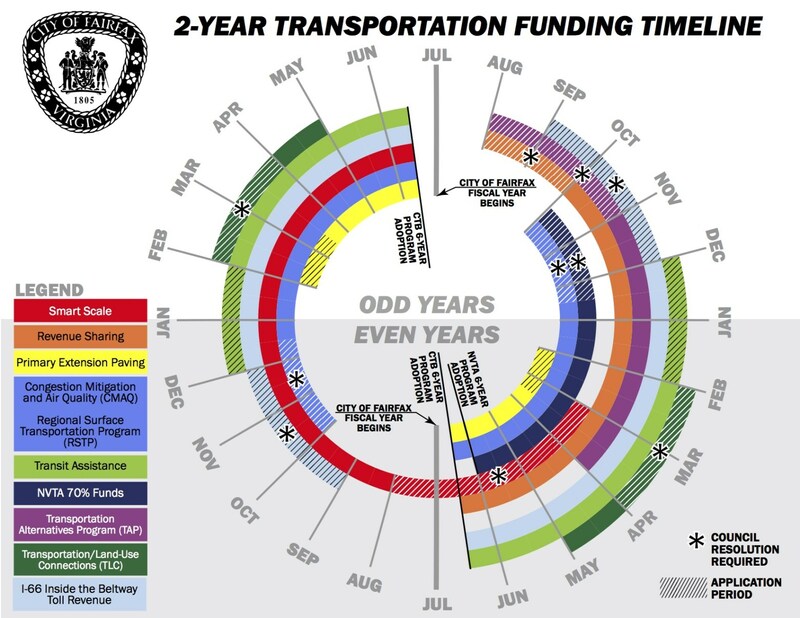 Transportation funding streams are complex. 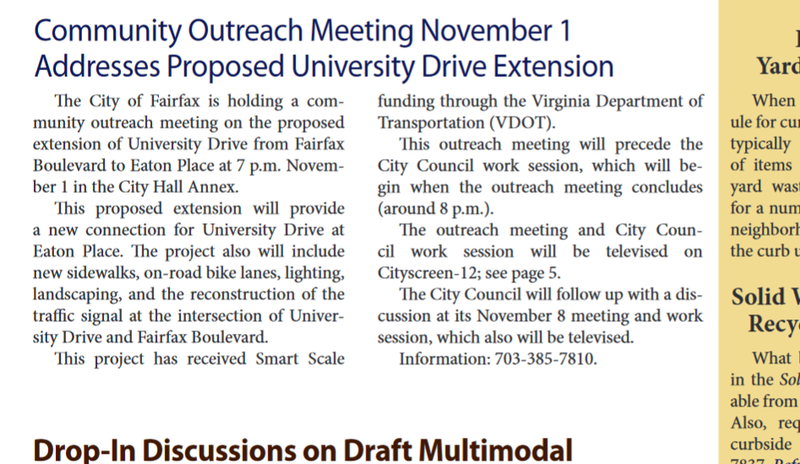 Fortunately, thanks to great work by Wendy Sanford and the team at the City of Fairfax, there is a visual way to begin to get your arms around the options. 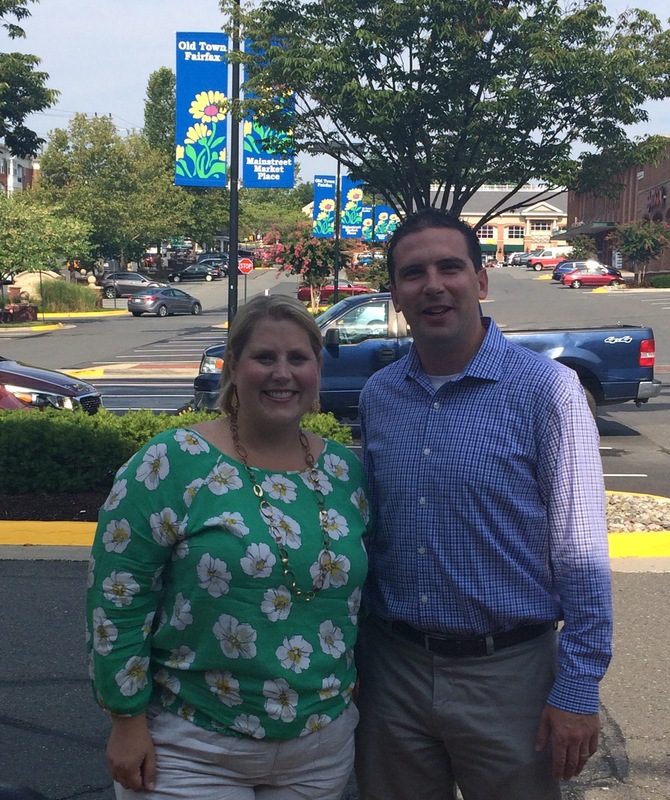 Highlighted in a recent blog post on Emerging Local Government Leaders (www.elgl.org) the City of Fairfax wheel of funding is now available to share beyond the 6.3 square miles of our great City. On T uesday November 7, 2017 the voters across the City of Fairfax will be electing a City Treasurer and Commissioner of the Revenue. I am proud to be voting to re-elect both Tom Scibilia as City Treasurer and Page Johnson as the Commissioner of the Revenue. 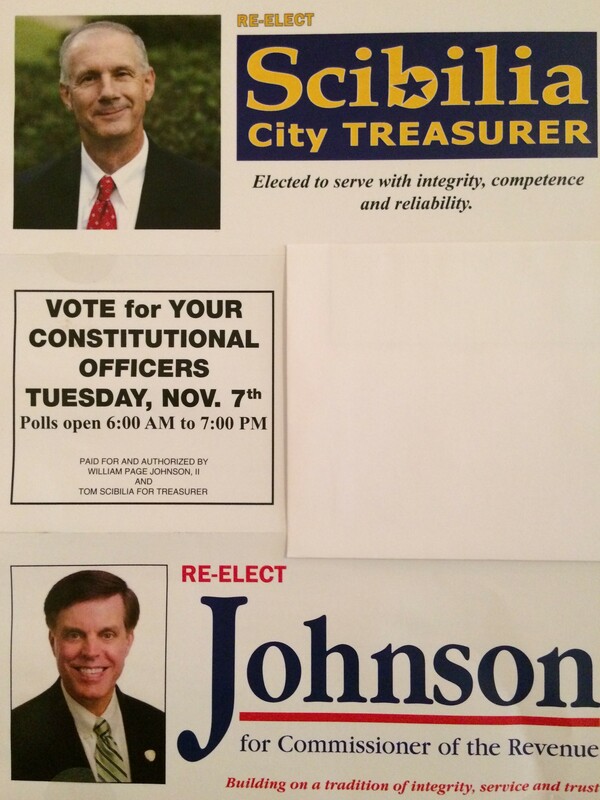 While both are running unopposed, these positions are critical to the success of our City. Tom and Page bring a wealth of knowledge, professionalism and clear sense of service to these positions. They have shown year after year their willingness to leverage new technology and ideas to enhance the City while always making sure to focus on what is best for our community. 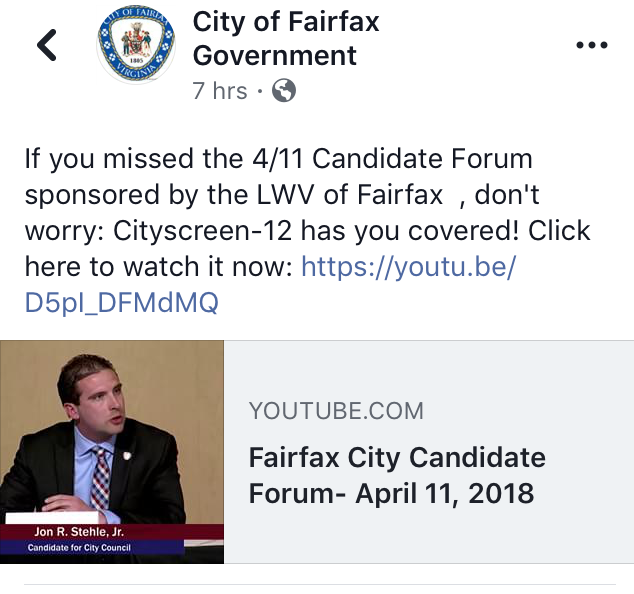 On Tuesday September 12, voters across the City of Fairfax will choose one person to join the City Council in the seat left vacant following Mayor Meyer’s election in February, currently being temporarily filled by Dan Drummond. This is a unique election where voters will be looking to add one team member to this Council. After careful consideration, I am excited to announce that I am supporting Jennifer Passey to be that addition. 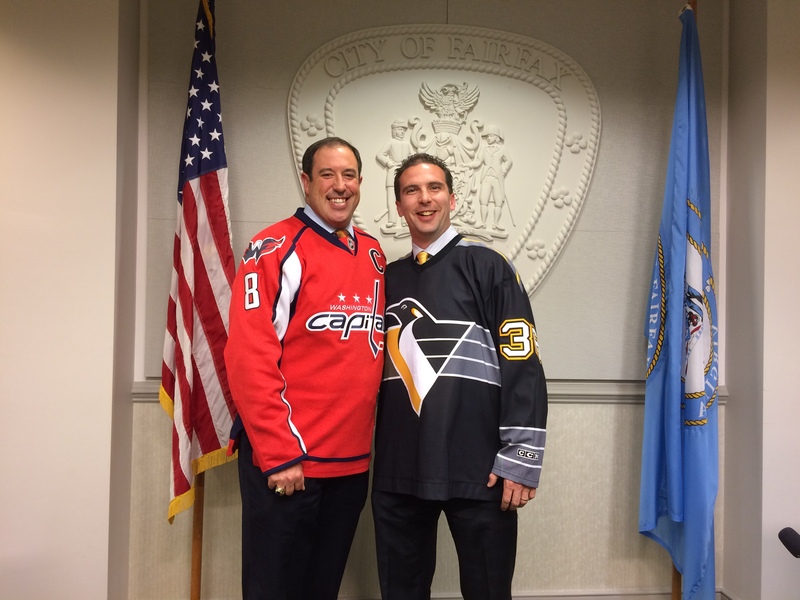 With the second round of the Stanley Cup Playoffs set to April 27, 2017, I am very pleased to announce that I am joining fellow Councilmember Dan Drummond in the the Team Dan vs Team Jon Britepaths Challenge. Tonight, the community had the opportunity to hear from the three candidates for the next Mayor of the City of Fairfax. 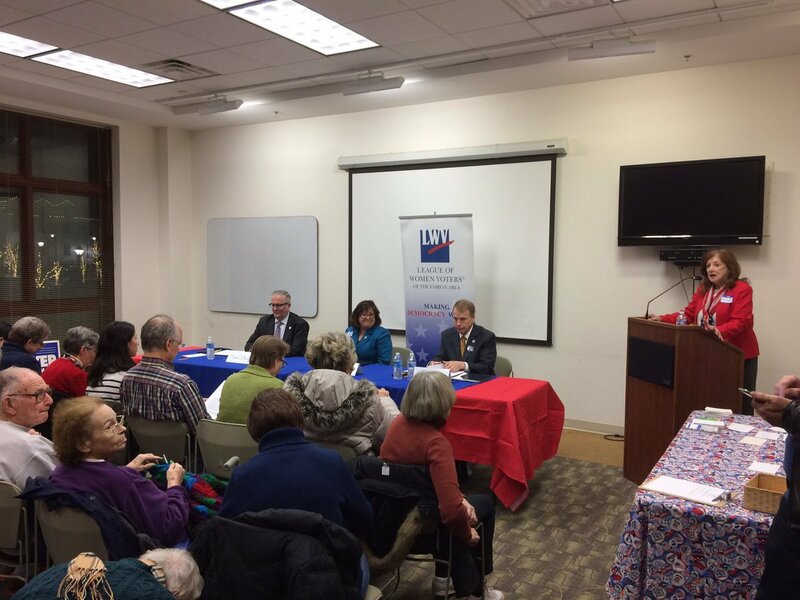 It was a standing room only crowd at the City Library and I would like to thank the League of Women Voters of the Fairfax Area for hosting the event. All three candidates responded to questions posed by the Fairfax City Citizens for Smarter Growth. Update: On November 4, City Staff posted responses to the comments made at the community outreach meeting. Thanks to all for the comments! 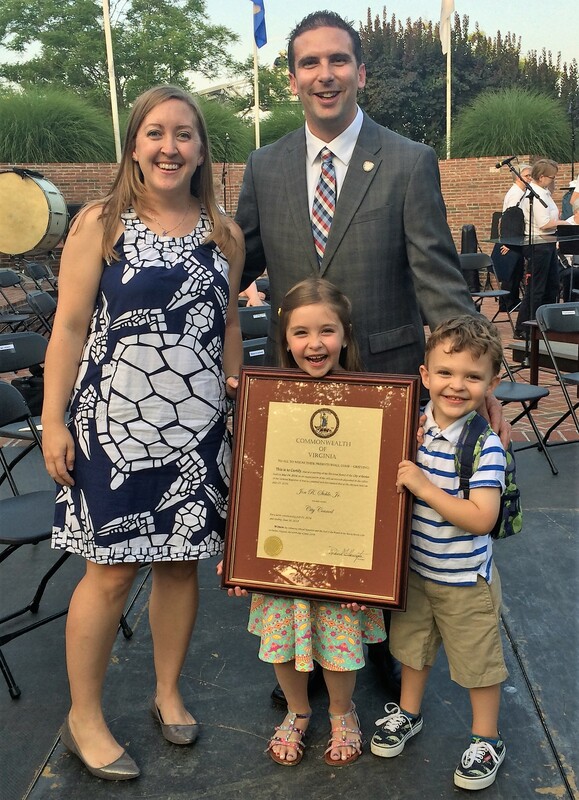 It is a big day for the City of Fairfax – school is back in session. 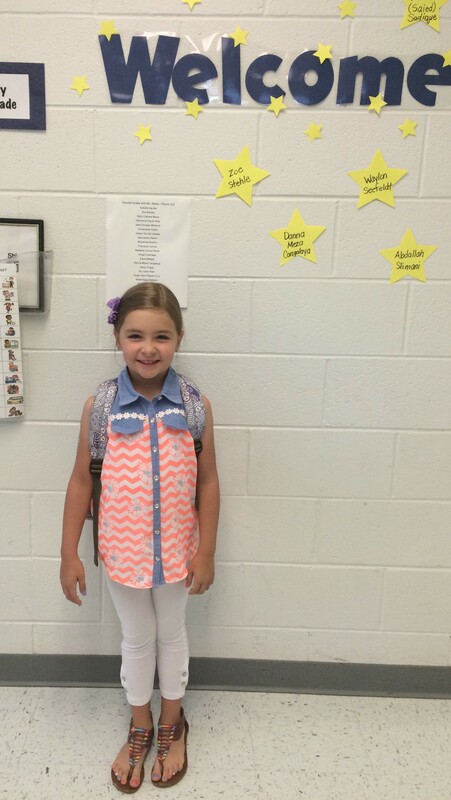 Zoe starts 2nd grade today at Providence. Changes are happening across the schools with new principals, new teachers and the opportunity of a new start – here’s to a great year! The same is true for City Council. This evening, we will be back to work with Mayor Stombres leading our work session. The past few weeks have provided a chance for everyone, including me, to step back and decide how we as a City will begin to process what happened over the summer. I took the oath of office 42 days ago to serve on City Council. At noon today, August 11 2016, for the first time in decades, the City of Fairfax will be without a mayor. When the City Council convenes on Tuesday August 16 it will be a Councilmember (not a mayor or acting mayor) gaveling us to order. Without question, I did not envision the Council meeting under these circumstances. It is however, where we find ourselves as a community today. At our meeting on August 16, we will be discussing two items: (1) a date of a special election for the purpose of filling the position of Mayor and (2) the possible appointment of an interim mayor. During this meeting, there will be an opportunity for comments by the public. This is a chance for the residents of this City to share their concerns, frustrations, and ideas while the entire community listens. Thank you to everyone for your support! I am honored to be a member of our next City Council. Thank you for expanding our "tiospaye!" 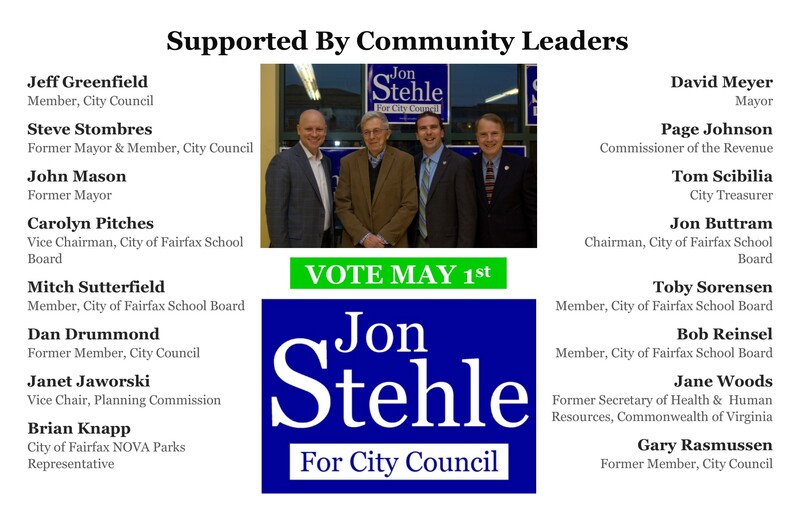 With the City Elections set for this Tuesday May 3, I am pleased to share that Mayor Scott Silverthorne, School Board Chair Toby Sorensen, and City Treasurer Tom Scibilia have joined community and business leaders from across the City in announcing their support of me for City Council. Steph and I knew the first day of school would be a big moment for our family. Zoe getting on the bus the first day (pictured to the left) and watching the bus drive off was a moment that I am not sure any parent is ever ready to experience. It brought a wave of emotions ranging from worry to excitement. I will give full credit to everyone involved with the City of Fairfax Schools, from our amazing Number 6 bus driver to every staff member at Providence, you all made the process seem effortless and it put me as a parent at ease. Thank you! I am very pleased to announce that on June 10, 2014 the City Council appointed me to a three year term on the Parks and Recreation Advisory Board. Mother's Day weekend and the first weekend after the campaign provided the perfect opportunity to start our second season at Kutner Park Community Garden. 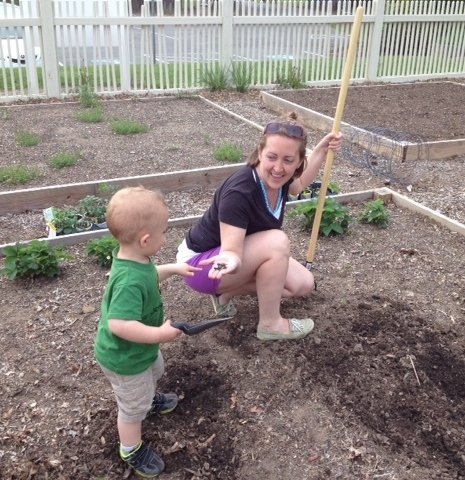 Zoe and Cooper enjoyed playing in the dirt and helping Steph and I plant everything from tomatoes to peppers. We also had the opportunity to meet our new garden plot neighbors. One of the best parts of having a community garden is meeting people from across the City in this shared space. We are looking forward to sharing many more hours with our neighbors tending to the garden and creating new friendships. I only hope that we can capture more moments like the one below where Zoe is looking very happy to be in the picture! 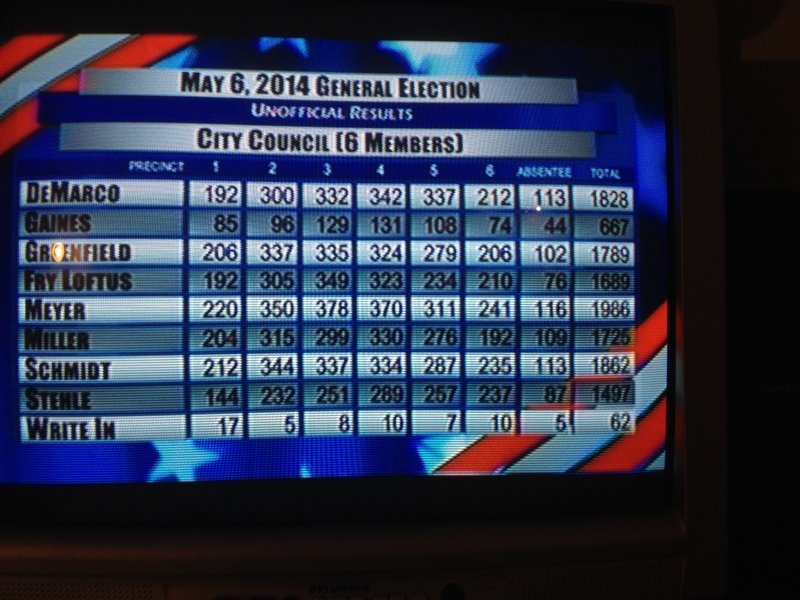 Congratulations to the new City Council. I am very proud of our team's effort and approach. 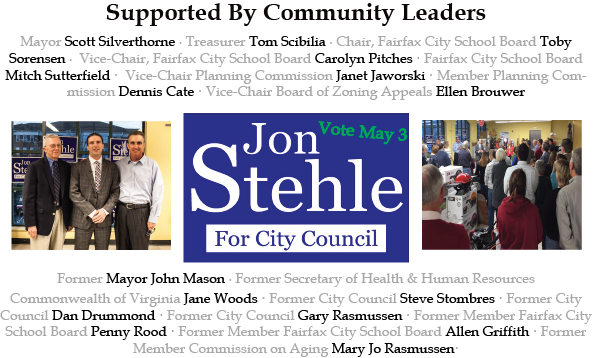 I take great pride in knowing that 1,497 voters across the City of Fairfax had the confidence in me to check my name at the ballot box. While this was short of the number needed to be on the next team of Council, it is very humbling and energizing to know we had a positive impact on the community. In just over 8 hours, the polls in the City of Fairfax will open and voters will begin choosing the next team of six for Council. Before the votes are cast tomorrow, I thought it would be useful to share some data regarding our campaign plan. 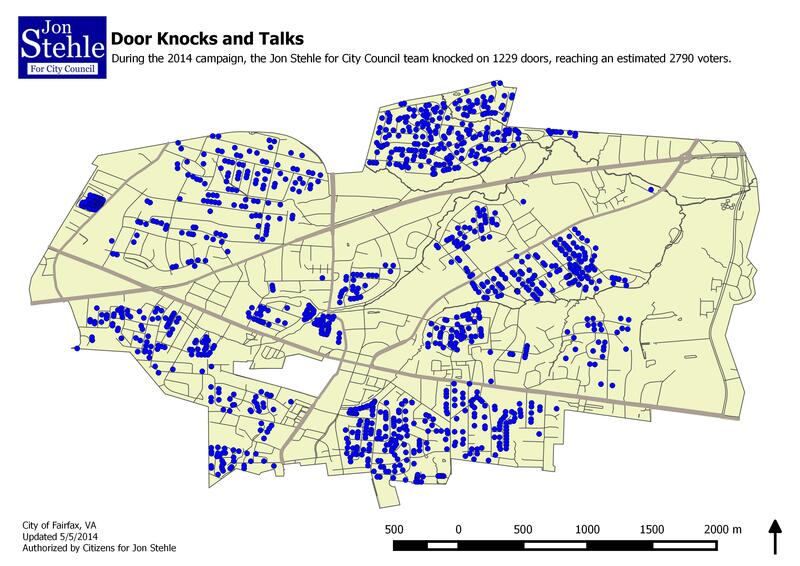 As with many campaigns, we sent mailings to voters across the City, we did literature drops across the City and we held events across the City. One particular part of our efforts were the Neighborhood Walk Arounds. During these events, we would gather in a neighborhood and knock on voter doors sharing our message. Thanks to the great work of our team of volunteers, I am very pleased to announce that we reached over 2,700 voters through this effort!